Toggles in 2 sizes and many color, we also sell Handi-bobs. 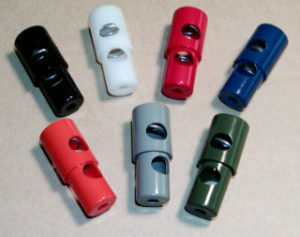 Mini cord locks are available in many colors. Maxi cord locks are currently available in 7 colors. Cord Locks are great for jackets, sweat suits, stuff bags, anything with a cord. The Mini Cord Lock is our best seller. Don’t forget our mini is a standard size cord lock used for most clothing and shoe lace applications. The Maxi Cord Lock is used for larger applications like duffel or sleeping bags and work boot laces. We are currently running many colors as standard fare, we hope to have a color for your needs. 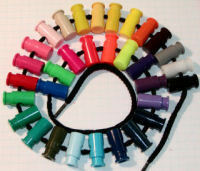 Handi-Bobs are a great organizer to keep spools of threads and their matching bobbins connected and thread controlled. No more knots and thread tangles. 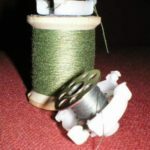 No more rolling and loose bobbins. 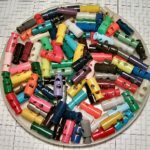 We specialize in small OEM orders, small quantities are not a problem. Most orders can be shipped within a day. Special color mixes are available, contact us for quotes. Check out our color page! !